The number of mainland Chinese tourists visiting Hong Kong this Lunar New Year dropped significantly, after currency fluctuations made Japan and South Korea comparatively cheaper to visit, and a bloody riot over street food sellers broke out at the beginning of the holiday week. 873,000 mainland Chinese visited Hong Kong over the seven days of Chinese New Year holiday, about a 12% drop from the year before, figures from Hong Kong’s immigration department show. Mainland tourists accounted for over 30% of all visitors to Hong Kong during the period, down from earlier . A total of 2.75 million people visited Hong Kong during the holiday, a drop of over 6% from last year. This year’s Lunar holiday figures are part of a larger trend—mainland visitors are traveling beyond Hong Kong. The city was the most popular destination outside China for mainland tourists until 2013, but they have increasingly embraced South Korea, Japan, and Thailand. Last year, the number of mainland visitors to Hong Kong dipped for the first time during Chinese New Year holiday since the city was returned to Communist control almost 20 years ago, although overall mainland visitors increased during January and February of 2015. 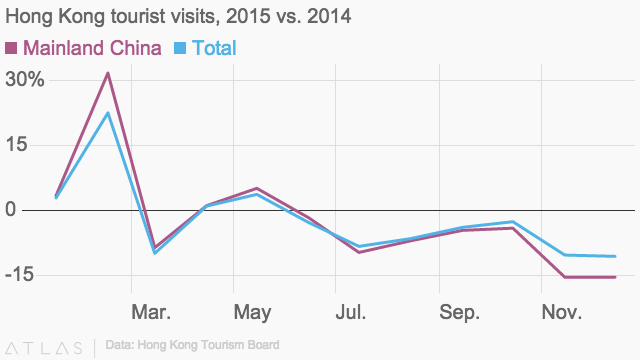 Overall mainland visitors fell 3% in 2015. Hong Kong, which relies on tourism for 5% of its GDP, is suffering economically. Hong Kong Disneyland reported an annual loss for the first time since 2011 on Monday, thanks to a drop in mainland visitors. The theme park lost HK$148 million ($19 million) in 2015, following a profit of HK$332 million the previous year, after 23% fewer mainland tourists visited. Hong Kong locals have long criticized mainland tourists for their alleged bad manners and their “locust-like” purchasing of goods like infant formula. The lack of resolution at the end of the Umbrella Movement, and Beijing’s growing crackdown on Hong Kong’s autonomy and free speech has also bred deeper resentment toward mainland China. The tension has spawned more public protests, which may contribute to the drop in tourism. Last year demonstrators heckled mainland shoppers over the Lunar New Year week, and were dispersed with batons and pepper spray. This year on Feb. 8, a crackdown on unlicensed street hawkers escalated into violence in which shots were fired by police officers, after Hong Kong’s “Localist” groups got involved. The drop in mainland tour groups was particularly significant this year, and fell 70% to about 120 groups per day during the holiday. It was “the biggest decline for more than a decade,” Joseph Tung Yao-chung, executive director of Hong Kong’s Travel Industry Council, told a local radio program (link in Chinese). 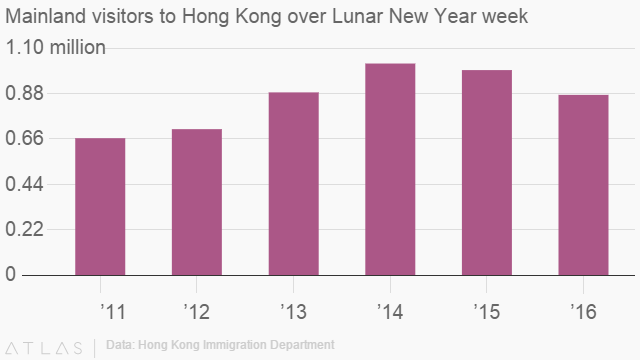 A manager at a Shanghai-based travel agency who asked not to be identified told Quartz his agency’s Lunar New Year package tours to Hong Kong declined by 30% this year, meaning about 100 fewer tourists. He said “negative news” about Hong Kong—including the death of a 53-year-old mainlander who was beaten by a gang that included mainlanders and one Hong Konger—had been widely read in China since the outbreak of the Umbrella Movement. Mainland tourists are choosing Japan and South Korea over Hong Kong because of “personal safety” and better exchange rates, he said. Hong Kong’s Umbrella Movement, though, had an opposite effect on tourism—visitors from the mainland actually increased in Hong Kong during the mostly non-violent street protests, as curious citizens came to take pictures and marvel at the demonstrator. Mainland Chinese visits to familiar destinations like Macau and Taiwan increased during last week’s holiday, up 4.7% and 9.9% respectively from the year before, China National Tourism Administration reported (link in Chinese).